The ideal SSD for ultrabooks and laptops that need an upgrade in speed, functionality, and responsiveness. Designed with the latest PCIe Gen 3x2 Interface, the P32A80 boasts transfer speeds that rival any M.2 SSD. It reaches incredible read and write speeds of up to 1600MB/s and 1000MB/s. 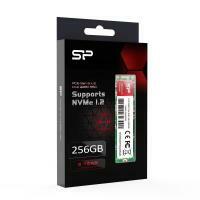 Need a workhorse SSD you can count on? This is it. Big things really do come in small packages. The full capacity P32A80’s size and power allows for system flexibility, and its state-of-the-art RAID Engine support ensures data integrity amidst the most demanding, high-end applications. The definition of resilience and efficiency offering high performance and transfer speeds so you get the power you need, when you need it. The P32A80 weighs in at a mere 8 grams. As versatile as it is effective, the SSD’s small form factor allows for easy installation in the thinnest notebooks, mobile applications, and PC desktops alike. NVMe 1.2 qualified, the P32A80 utilizes the latest SSD controller technology to support Host Memory Buffer (HMB), resulting in an improved overall performance level while reducing cost and power consumption.